Love the feel, sturdiness and tracking performance of hard-shell kayaks but don't have space and/or budget for one? This Advanced Elements Kayak is one of the best inflatable kayaks and the perfect compromise as it offers the best of both worlds. An aluminum rib frame gives it the looks, paddle-ability and track-ability of a hard-sided kayak while inflatable chambers and a folding frame make it highly portable, versatile, convenient, and easy to store. It folds down into an impressively compact package that fits in a medium size duffel bag and can be stored in a closet. If you're weighing this kayak against other options, our review will help you decide whether this is the right option for you. Read on to find out what the Advanced Elements Inflatable Kayak has to offer. An AdvancedFrame kayak, it has a hybrid design that is a combination of a folding kayak frame, inflatable chambers, an aluminum frame, and rigid panels. Three-layer construction give this kayak excellent resistance to punctures and durability. Hard edge bow with aluminum frame reinforcement enables it to cut through the water with ease. The aluminum frame defined stern functions as a skeg improving tracking farther. There is also a tracking fin for better tracking. Seven air chambers – two main chambers, the floor, deck lift chambers, and combing – ensure safety on the water in the event of a puncture. A storage compartment, bungee deck lacing, and D-ring tie downs provide storage and attachment options for the items you want to bring along. Easy-to-use spring valve that works with most pumps and integrated pressure relief valve in the floor. It also features molded rubber handles for ease of carrying to and from the water, a paddle guard, reinforced and welded seams for durability, and an adjustable seat with high back support for comfort. Material: A PVC Tarpaulin hull that is composed of a tough polyester in between two layers of vinyl and an aluminum rib frame. Usability: Designed for day touring, this Advanced Elements Inflatable Kayak is perfect for recreational kayaking in lakes and rivers. You can also use it on the open ocean, ideally with a backbone installed to ensure it doesn’t flex in the face of waves. It is not a good ocean kayak for high swells, the surf, or the coastal ocean where sharp coral rocks abound. It is lightweight and folds down small enough to fit in a suitcase-sized duffel bag. It is easy for even a petite person to handle and carry alone. Together with its accessories, it fits in a small trunk. You can keep it in your car all the time, bring it along wherever you go and enjoy the water whenever the opportunity presents itself. When not in use, it doesn’t require a lot of storage space at home and will fit in a small closet. For small and petite paddlers, the cockpit area has sufficient leg room for comfort. It is too small for big and tall people though. If you’re over six feet tall, the Expedition or Convertible Advanced Frame Kayaks are better fits. The seat is nicely padded, adjustable and has a breathable mesh foam back that offers high back support. Long paddling sessions on this kayak aren’t going to be uncomfortable or painful. A coaming area prevents water from getting into the seating area and is also the place to attach a spray skirt. Set Up: When you want to enjoy a ride, setting it up is as simple as unfolding the kayak, inflating it, unfolding and attaching the seat. Launching it easy as you can carry it with one hand, place it in the water, enter and start paddling. Inflation is easy and quick. Once you get the hang of it, it will take you 5 to 10 minutes to get it ready for the water. With seven air chambers to fill with air, a pump is an essential accessory for this kayak. We recommend purchasing a high volume pump with a pressure gauge to make inflating it properly easy and quick. A 12V electric pump will inflate it quickly but a manual pump is required to finish off the inflation. At the end of your adventure, all you have to do is dry it, open the air valves to get the air out, fold the kayak, and stuff it in the duffel bag it comes with. Ensuring the kayak is completely dry before storing it is very important if you don’t want to have to deal with mildew the next time you want to use it. Drying it takes time and effort though. You might want to bring along a packable but highly absorbent camp towel to wipe it down and help speed up the drying. You can also spray it with a waterproofing spray that will cause water to bead and slide off rather than penetrate. This will make drying it quicker and easier. 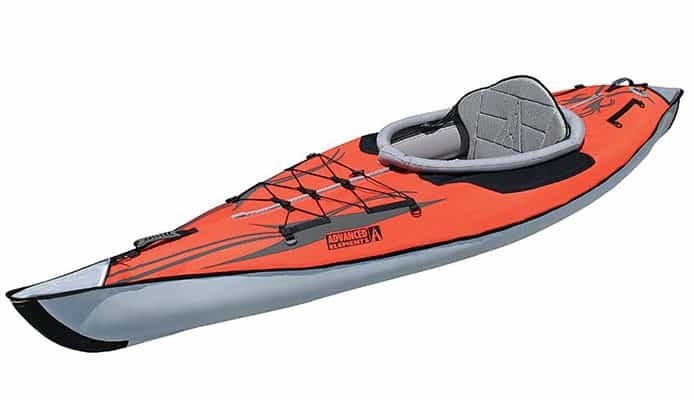 Performance: Out on the water, this Advanced Elements Kayak feels stable, tracks very well, and is easy to maneuver. It handles very well in flatwater and is also graceful in class II rivers and mildly choppy conditions. The aluminum rib frame defines the bow and stern and help this kayak slice through the water with ease and track straight. One can also use the stern as a skeg to improve tracking. Its speed is pretty good. Paddlers have no issues keeping up with average hardshell kayaks or top-notch recreational kayaks. However, it is an inflatable and can’t achieve the top speeds hardshell vessels are capable of. Material: 95% – The material is a heavy-duty polyester fabric coated with two layers of vinylmaking it extremely tough and puncture resistant. Punctures are always a concern with inflatable kayaks but this one is tough and it will take something like a sharp kayak knife or a pointy shard of glass to puncture this one. It is not all soft though. An aluminum rib frame defines the bow and stern and gives this kayak a rigid shape and hard-shell like performance. This kayak can withstand beatings from the typical hazards encountered in the water and hold up well. Design: 95% – The hybrid design composed of air chambers, a hard frame, and a folding frame is well thought out and executed giving this kayak a feel, performance, and durability close to that of a hard-sided kayak while keeping it portable and easy to store. For safety, it is composed of seven air chambers instead of one. The Advanced Elements Inflatable Kayak also looks great and will get you envious glances, compliments, and inquiries. Price: 95% – This kayak is accessibly priced making it an affordable alternative to hardshell kayaks. It is hard to find better quality and performance at its price level. Overall: 95% – The Advanced Elements Inflatable Kayak is one of the best inflatable kayaks on the market. It is durable, easy to store and transport, versatile and reasonably priced. It is not a replacement for a hard shell kayak but based on its build quality and performance on the water, it is the next best thing. This particular Advanced Elements Kayak is an excellent inflatable kayak. Its durability and performance are close to that of hard kayaks. It is a great recreational kayak for flatwater kayaking and a fantastic alternative if you don’t have space and/or the budget for a hard-shell. It is also a great choice for a second, more convenient and portable kayak for hard shell kayak owners. As a fishing kayak, it is a stable platform but it is important to be careful with hooks and knives to avoid puncturing the air chambers. If you decide to go with it, you won’t be disappointed with your choice. Because it is easy to transport and set up, you’re going to find yourself getting out on the water and enjoying it more than you would a hard-shell kayak. A very well built kayak, you can rest assured you will enjoy it for years to come even if you’re an avid user. Owners of this Advanced Elements Inflatable Kayak say it is one of the best purchases they’ve ever made! Does this Advanced Elements Kayak sound like the perfect kayak for you? Let us know your thoughts in the comment section below. Love the feel, sturdiness and tracking performance of hard-shell kayaks but don't have space and/or budget for one?